All of these pieces have been vetted as authentic and show signs of use and age. 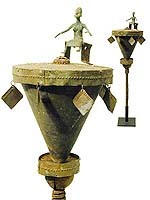 Among the Fon people of Benin extended families kept large staffs crafted out of iron in family altars housed in a small building in the courtyard of the family compound that were tended by elder woman in the family. 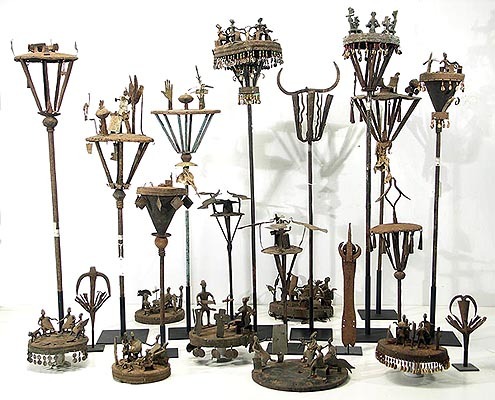 Known as Asen, these forged iron staffs were created for each ancestor serving as a link between the living and the dead where offerings and recognition would be offered to each Asen during the dry season in a ceremony called ahanbiba. During complex funerary ceremonies an Asen would be consecrated to the ancestor and regularly sacrificed to over the year. 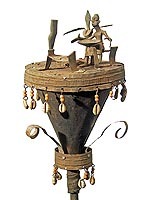 The earliest example of Asen dates as early as the last years of the 1700's with a forged iron staff surmounted by figures cutout of sheet metal or cast bronze metal figures surmounting a flat iron disk supported by a number of iron struts connecting it to the shaft. . 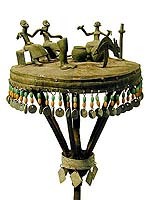 This particular type is called "Asen Gbadota" or "Asen With a Hat", because of the flat disk surmounting the vertical supports in the shape of an umbrella. 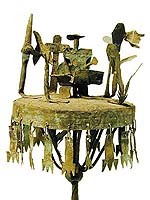 The cut-out figures represent the ancestor characterizing what the individual achieved during their life and the status the individual had achieved within their community. The imagery on top of the 'hat' often draws upon a pun or proverb to make an observation of the individual during their life. 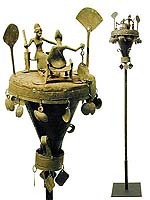 Further Reading: Bay, E.G., "Iron Altars of the Fon People of Benin, 1985. 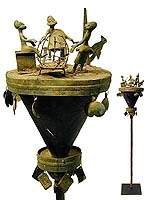 Some are more abstract or depict birds and served another function. They are shown on FON ASEN STAFFS / BIRDS and ABSTRACT. Tops that have survived without their staffs are shown on FON ASEN STAFF TOPS. Staffs made of iron and brass were displayed in royal compounds to affirm kingly power. Usually depicting a king with related motifs, they were called "Asen" and commemorated past rulers. Some are more abstract or depict birds and served another function.